It’s here, in one of the most beautiful places in the world, where golden domes of the Saviour of the Spilt Blood Church float in the sky, and the unique wrought-iron railings of the Mikhailovsky Garden are reflected in calm waters of the Griboedov Canal, that St Petersburg awaits us. For already five years glimpses of wine in crystal, or irreproachably white china-ware proudly carrying exquisitely decorated dishes are being reflected and multiplied in the vast mirrors of the Restaurant. The Restaurant’s cuisine can rightly be called European, through with a strong Russian influence — coming from St Petersburg, majestic and hospitable, refined and unexpected, always enchanting. Every guest is greeted with live violin music and nice and elegant service. The pride of the Restaurant is a Fancy-dress Show in Peter the Great Assembly style — the best show in the city. The Show offered by the a la carte Menu is excellent as well. A whole roast suckling-pig, urrounded by a retinue of braised cabbage, baked apples and mixed vegetables and salad deserves a storm of applause. It is accompanied by a Russian speciality — the unique and famous horse-radish sauce. The entrance of the kingly Suckling-Pig is really radiant. It is served surrounded by blazing candles. 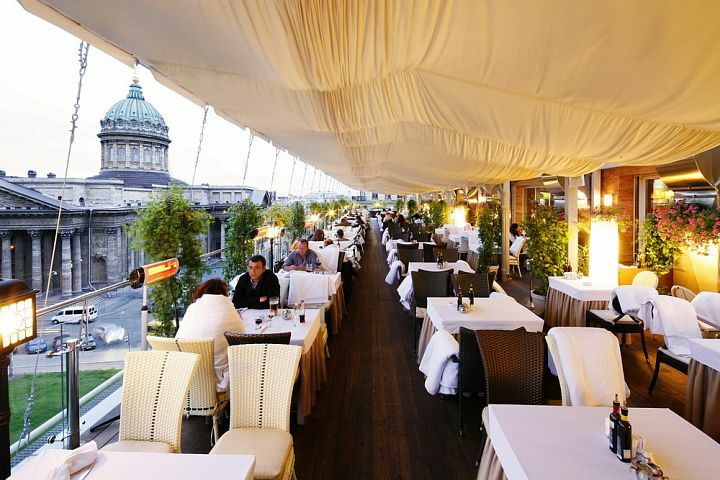 The Restaurant’s Menu deserves a repeated «Bravo!», though only selected guests will find the courage to call out «Encore!» because the meals in St Petersburg, in the Russian tradition, are really generous.